This turn table was originally a Mermac (?) Toy Co. of Cleveland OH product from 1953, made for Lionel 3 rail use. Two "D" cell batteries powered the table. The reduction gearing was strong enough to move a loco weighing up to 8 lbs (Sunset B&O Q-4b 2-8-2). It has been rebuilt and modifed for two rail. Styrene sheet and structural members made new side girders. A pit rail was added and trhe bridge modified to receive it. The electrical pickup tower is also built of styrene, brass rod and ABS. Wood decking was applied. Railings are ABS Plastruct parts. 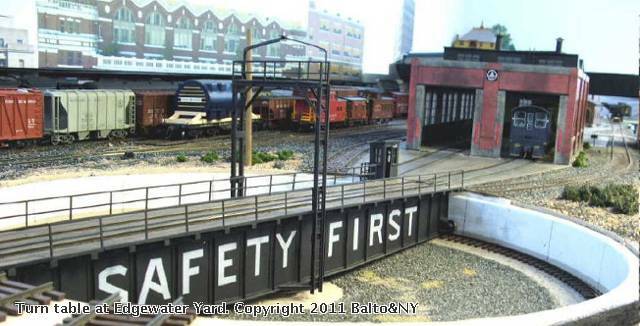 The "Safety First" lettering follows 1920s-1940s B&O practice. Wow, that is a nice looking turntable. Hey, I recognize that train station print in the background - that's Vancouver's waterfront station, right? Last year, I helped Kent Johnson with a lasercut kit to build a model of that station, so I knew it as soon as I saw it. Vancouver it is! I saw it when I took a cruise to Alaska a few years ago. I had a 5 1/2' blown-up print of it made, cut it out and pasted it to the wall for a backdrop. I then built an 11 1/2' long high level paltform in wood and styrene to go in front of it. On the computer I drew and printed facades to go behind the platform and under the Vancouver building to complete the scene. 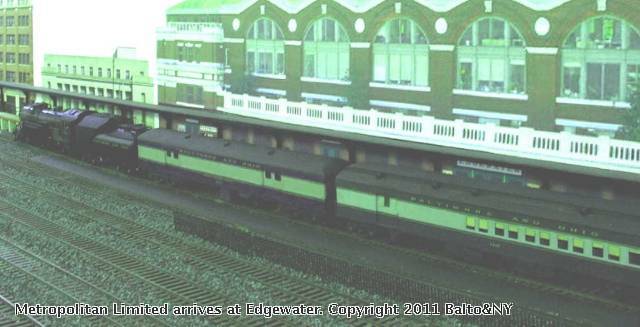 The name of this main station on the Baltimore & New York was Edgewater. The building to the left of the station is an enlarged photo of the local post office. The farthest one is my attorney's office building, before I moved to Tulsa last year. 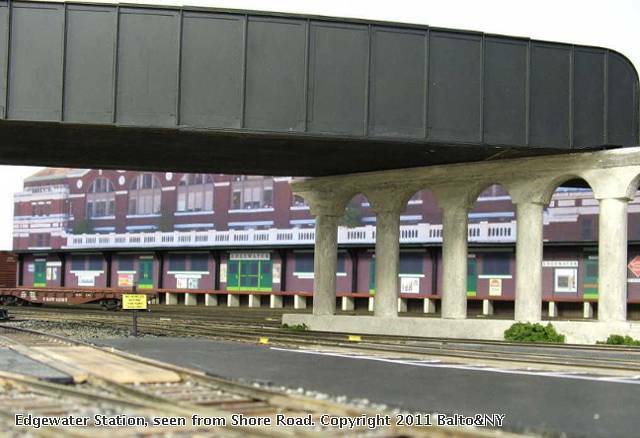 Another view of Edgwater station as seen from Shore Road and through the yard tracks. The computer printed facades were fitted together under the big Vancouver print and a removable, 11 1/2' long high level paltform was placed in front of the back drop. I like this under the bridge shot. I feel like I'm standing there which makes this a good picture in my opinion.